Today I saw my first pea peeking out from one of the flowers. The pea plants continue to grow. The vines on a couple of them are getting seriously thick. The peas in the middle aren’t as thick and healthy looking, but I saw a bud on one of them. The tomatoes continue to grow. I think they are starting grow a little faster now, but they’re still nothing like the peas. Today I saw my first flower. 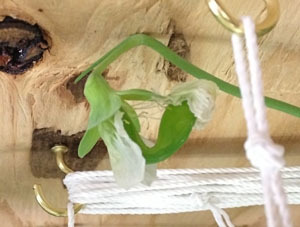 One of the pea plants blossomed. 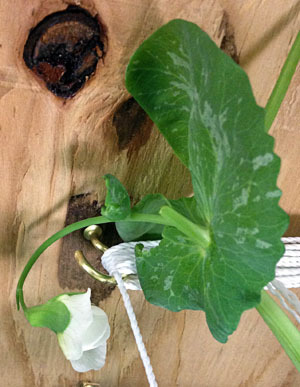 This plant is in pot eight, which is right next to a light. That pot has four pea plants and two tomato plants growing in it. I also found two other buds on other peas. The tomatoes continue to grow as well. 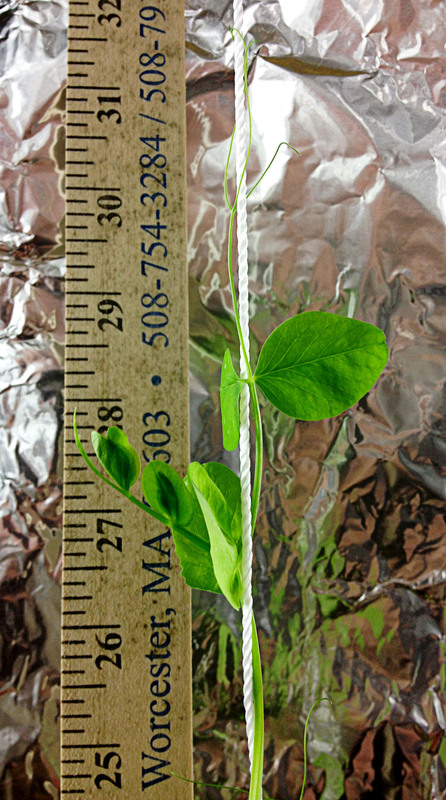 They aren’t shooting to the ceiling like the peas, but they are developing more leaves and branches while slowly growing taller. 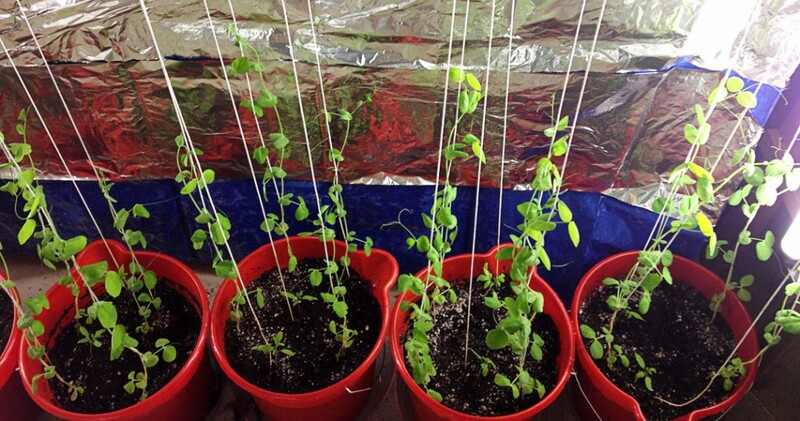 It is clear that the plants close to the lights are doing better than those in the middle of the row. It’ll just be interesting to see how many of them produce food. The peas continue to grow quickly. I’m now pinching off their tops because they are reaching the maximum height of the artificial greenhouse. There appears to be a small bud on one of the vines. The tomatoes continue to grow slowly. 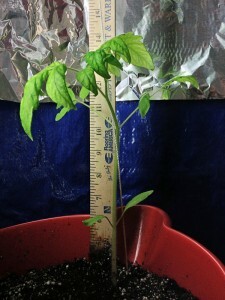 The one with the ruler is now almost twelve inches tall. That means it has grown about two inches in the last nine days. It’s been fifty-three days since I planted the seeds for the cellar garden experiment. Some of the peas are now five and a half feet tall. It looks to me like the peas in the end pots closest to the lights are doing much better than the peas in the middle. The peas close to the lights are taller, have larger leaves, and have thicker stems. However, there are some in the middle that are doing well. All of them are still growing. In the crowded pots, some of the vines are smaller than their siblings in the same pot. The tomatoes are a little different. They don’t seem to care how far they are from the light. On the other hand, they do seem to care how many plants are sharing their pot. 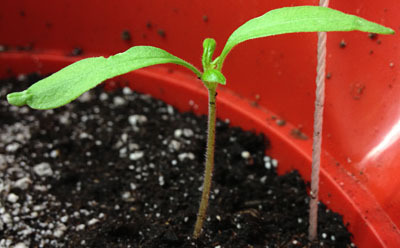 The tomatoes sharing a pot with just one other plant are larger than the ones sharing their pot with several other plants. There are no conclusions to be drawn yet, but I’m guessing the peas in the middle won’t produce much if any. I’m also guessing the tomatoes in the crowded pots won’t produce much if any. It’s been thirty days since I planted the seeds for the cellar garden experiment. The plants are doing quite well. I did have a bit of a scare when the leaves on the pea plants became mottled. Fortunately, the good people over at GardenWeb calmed my fears and let me know this is perfectly normal. Ken at GardenWeb also made me think about various things such as temperature. These plants are growing in my cellar which is currently hovering in the mid to high sixties. The soil is trending in the low to mid sixties. The tomatoes are coming along. They are getting bigger and developing more leaves. They haven’t stunned me with their growth, but they are still growing. But the real star of the show are the peas. Remember this photo showing the same pea plant on November 21 and 22? The yard stick on these photos is buried 4 inches into the dirt, so on Nov 21 the topmost leaves were 13 inches above the ground. On Nov 22 they were 14 inches up. 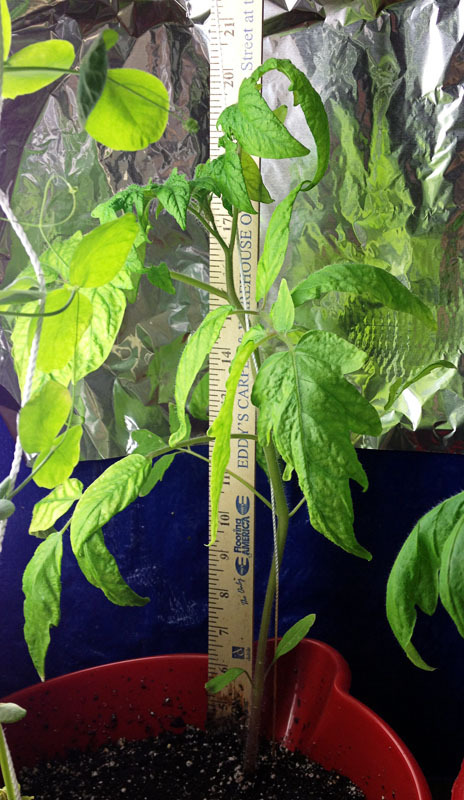 Now on December 3rd, just eleven days later, they are 25 inches above the ground. That’s one inch per day. This yard stick is in one of the middle pots, it is not in one of the ones near the lights. I find I need to tend the peas twice a day. 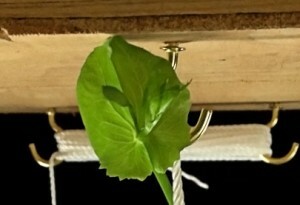 Every morning and every evening I stop by the cellar to wrap the peas around the strings. Even doing it that frequently they are often grabbing onto the plants around them. In a real garden I’d train them up a trellis and wouldn’t worry about them tangling up with each other. However, in this experiment they are packed in pretty tight and I need to be able to reach through them. 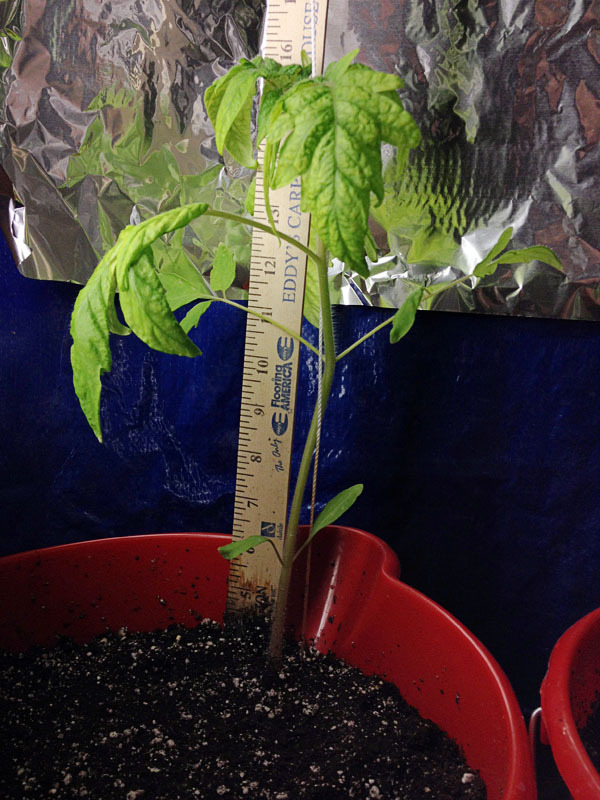 Also, every pot has at least one tomato plant and I’m going to need to be able to tend them as they grow. 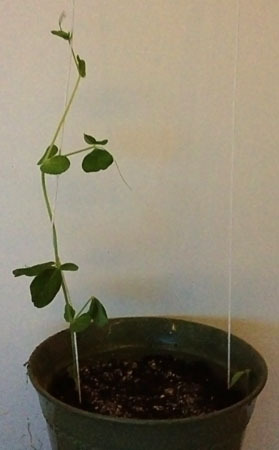 I need to keep the peas to their own string in this experiment. There’s mold growing on the fertilizer piles. I should have just sprinkled a little fertilizer on at a time. In addition, the soil is probably too wet. I really wasn’t prepared for how much water this potting soil would hold and how long it would hold it. It acts like a sponge and doesn’t let go and dry out. I’ll clean up the mold as well as I can tonight and hope for the best. I think it probably won’t be a serious problem, but I don’t have enough experience to know for sure. Argh. I started more seeds than I needed for the cellar garden experiment. I did that so I’d be sure to get enough strong, healthy plants. I planned to throw the extras in the compost bin, but didn’t do so right away. They were still sitting there on the floor of the cellar near the artificial greenhouse yesterday and they were still green and growing. Every time I saw them I kept thinking that as long as they were alive, the plants in the greenhouse weren’t really proving anything since these plants weren’t getting anywhere near as much light. However, they also weren’t getting watered and their roots were bunching up in the tiny sprouting pots. I decided to give one of each type a better chance at survival. I filled a pot with potting soil, mixed in some fertilizer, planted one pea plant and one tomato plant, and gave them some water. This pot is sitting outside the greenhouse and does not have any direct light. The only light it gets is whatever manages to get around or through the foil covered tarps. This photograph was taken without a flash, so you can see that there is enough light to see, but not enough to take a decent photo. It’s really hard to convey how much or little light there is in a photo. It is bright enough that I can see just fine, but dark enough that I don’t expect these plants to survive very long and I really don’t expect them to produce any fruit if they do survive. 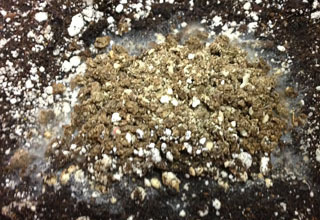 I don’t want nutrition to be the issue in the cellar garden experiment, so I’ll be adding fertilizer from time to time. Since I don’t know anything about fertilizer, I asked the woman down at the local greenhouse to recommend one and she suggested Tomato-tone by Espoma. The instructions say you should place a 1 cup line down each side of a five foot row of plants or in pots use 3 tablespoons for each plant. It also says it should be kept at least three inches away from the plant stems. I’m a little nervous about burning the plant stems and roots, especially in the densely packed pots. So, even though 3 tablespoons per plant rule would work out to one and an eighth cups, I limited myself to one eighth cup per pot today. Also, although I did add some water to start it mixing into the soil, I did not add a lot so most of the fertilizer is still on the surface of the soil. 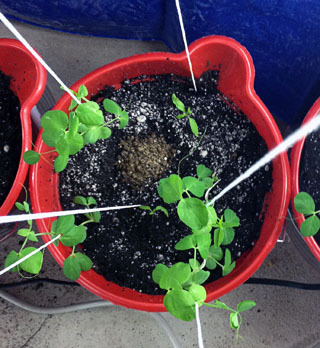 In the densely packed pots I put the fertilizer in a little pile in the middle as far from the plants as possible. Naturally that wasn’t very far. In the other pots, I made a line down the middle and the watered just the middle of that line. 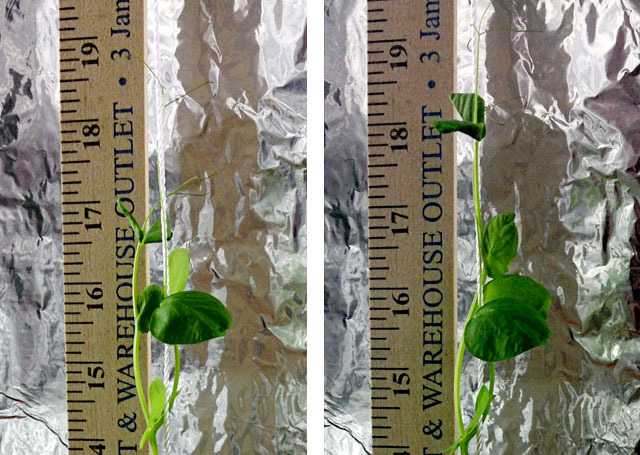 …may not boil, but a watched pea certainly grows. When I first planted the plants I kept them on a wire shelving unit in front of a window. One day I sat on the couch to watch a three hour football game near that window and just as I sat down I noticed that the tops of the pea plants were close to the shelf above them. I swear as I was watching that game I’d look over from time to time and see them getting closer and closer to that shelf. This past weekend I had to transplant the peas since they had grown too tall to continue without support. However, it was too early to transplant the tomatoes. They were still tiny and weak. 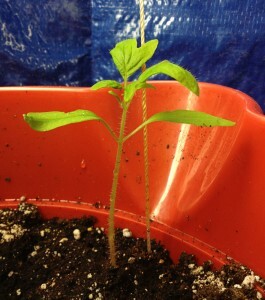 I should have left them in the window for another week or two, but I went ahead and transplanted them. I’m not sure why. I’ve been concerned they wouldn’t survive so I was glad when I came home from work today and found they had started growing new leaves. This weekend they only had two leaves each, now several have another set of small leaves. I still don’t know for sure if they’ll pull through, but I’m hopeful. If more than one or two tomatoes don’t survive, I’ll pull them all and plant new from seeds right in those pots. 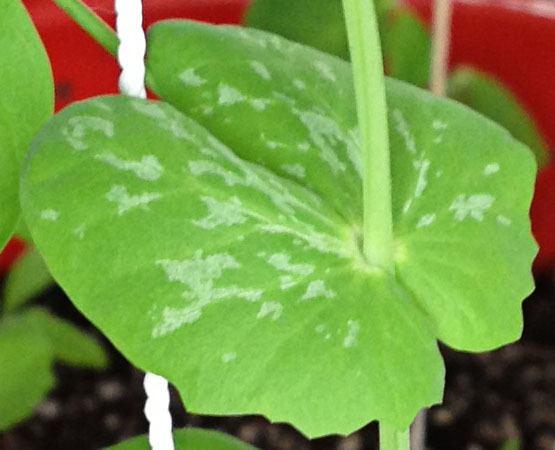 It is important for the experiment to have nearly all healthy in the beginning.